My story of hijackings, captivity and war. My captivity for three weeks at the hands of the Popular Front for the Liberation of Palestine (PFLP) during Black September 1970 is not simply a harrowing personal story or merely part of a compelling human drama that riveted the world's attention for three weeks. It is the tale of a pivotal moment that changed the course of Middle East history and still informs us today on the motives of Israel's enemies, the roots of Islamist terrorism, and how to confront both. On September 6, 1970, the PFLP triggered one of the most audacious and spectacular terrorist acts ever with its four attempted airplane hijackings, a record that stood in infamy for 31 years. I was 17 years old with my mother and four younger siblings aboard one of those planes, TWA flight 741 out of Frankfurt, Germany, on our way home to Trenton, New Jersey, after a summer in Israel. Our plane was forced to the desert floor in Jordan, about 35 miles northeast of Amman. As we sat in the eerie darkness once the power was turned off, a hijacked Swissair plane landed right behind us, nearly colliding with our plane. The PFLP threatened to blow us up in 72 hours if its demands for the release of terrorists in Israeli and European jails were not met, and they wired our plane with explosives. The next day, the non-Jewish women and children were sent to hotels in Amman, and over 100 people lived aboard our plane for almost a week. With the power off, we had neither air conditioning during the blistering hot days, nor heat during the cold desert nights. There were no lights and no functioning toilets. Food and water were scarce. Jewish passengers were interrogated, some threatened at gunpoint. To the Holocaust survivors among us, this was a recurring nightmare. I descended the rickety wooden ladder off the plane, sure that I was being taken to be killed. At 2 AM on Friday morning, 9/11/1970, as I slept soundly for the first time, a flashlight was suddenly shining in my face, waking me. I was wanted up front, for questioning I was told. But I knew that I was being taken off the plane. As I walked up the aisle, I began to quake uncontrollably. My mother, who had been sitting a few rows behind, heard the rustling and quickly came to me, trying to convince my captors not to take me away, that I was but a child. She was threatened with a gun, and I descended the rickety wooden ladder off the plane, sure that I was being taken to be killed. As it turns out, nine other American men, including eight Jews, were also taken off, and we were driven to a refugee camp abutting Amman. We were put into a small, bare room, our door was locked, and there we sat for two days, in fear, uncertain of our fate. I read Psalms to comfort myself. Our situation eased over the next few days, but only temporarily. Meanwhile, on Saturday, the PFLP blew up three planes in the desert; a BOAC plane had been hijacked and flown in on Wednesday. The PFLP released all but 54 hostages -- 38 Americans (including five women) and 16 Europeans -- whom it divided into various groups. On Wednesday, September 16, the hostages were shuffled, and I found myself with 31 others in a bare three-room apartment in Amman. The next morning, we awoke to the roar of artillery shells and machine gun fire, as full-scale fighting erupted between King Hussein and Yasser Arafat's PLO. Over the prior years, the PLO had sown anarchy in Jordan -- its then-base of operations against Israel. The hijackings proved to be the last straw for King Hussein, who was now determined to reinstate his sovereignty over his country. Over the next ten days, a bloody war raged in Jordan. We sat under the shelling, situated as we were in a Palestinian stronghold. Water and electricity were cut off, and food and water were once again scarce. The conflict took a dire turn on September 20 as Syria invaded Jordan with over 200 tanks and infantry to come to aid the PLO. Israel massed troops near Beit Shean, both the US and Soviet Union beefed up their forces in the Mediterranean where their ships played cat and mouse, and a broader regional conflict seemed imminent. A desperate King Hussein requested Israeli assistance in saving his throne. The US did the same, as it could not prop up Hussein on its own; the war in Vietnam was stretching thin its forces. After several tense days, Hussein proved able to repulse the Syrians himself. He then returned to fighting the PLO, and on Friday, September 25, Yasser Arafat agreed to a ceasefire. The next day, as we walked towards freedom through war ravaged Amman, we twice barely escaped being shot by machine gun fire. Finally, we threw ourselves into the Red Cross cars that were sent to pick us up and sped off to a hospital. The next day, after 21 days of captivity, the 32 of us flew out of our Jordanian hell. By September 29th, all of the hostages had been released unconditionally, but Britain, West Germany, and Switzerland decided nonetheless to release the Palestinian terrorists in their jails, Britain, in doing so, violating its extradition treaty with Israel. As a direct result of these events, the leadership changed in Egypt and Syria, as Anwar Sadat and Hafez Assad took over the presidencies of their respective countries. Over the next ten months, King Hussein waged a low-intensity war against the PLO until, by July 1971, he had booted the PLO out of his country. It soon re-based itself in Lebanon where it again gradually sowed chaos. The Palestinians, who had incurred about 2,500 dead and several thousand more injured during the fighting, began referring to the month as Black September. In September 1972, a new PLO terror group named after that month perpetrated the Munich Olympics massacre. Israel's willingness to intercede on King Hussein's behalf led to a warm, if still sub rosa, relationship with Jordan and to a strategic relationship with the United States. Long before there were checkpoints, house demolitions, and separation fence, Palestinian terrorism was motivated by the desire to destroy Israel. One thing is clear from this whole episode: Palestinian terrorism against Israel has been going on a long time -- long before there were checkpoints, house demolitions, and separation fence. Even before the "occupation." Palestinian terrorism was motivated in 1970 by the desire to destroy Israel. Unfortunately, I see no indication that anything has changed. And perhaps the most important lesson from September 1970 for today in our own fight against terror can be drawn from King Hussein. After years of trying to mollycoddle the PLO, even offering Yasser Arafat the premiership of Jordan at one point, the hijackings made King Hussein finally realize that there is no appeasing terrorists or rationalizing terrorism away. The longer one waits to confront it, the heavier a price one pays. Hussein concluded that terrorism is a "cancer" that needs to be pursued resolutely and relentlessly until eradicated completely. He pursued his war on terrorism with calm conviction and clarity of vision, despite the criticism of other Arab countries and Western media. We can learn from the way he did it, too: he specifically appointed a prime minister of Palestinian origin to oversee the fighting to send a message: he was not fighting against Palestinians, but for law and order. By extension, our fight against terrorism today is not an attack against the Palestinians, against the Arab World, or against Islam. Rather it is a fight for peace and tranquility, for civilized society, for our way of life. It is directed only against those who design to murder or destroy us. We must not be reticent and need not apologize for our efforts. Sadly, I don't have a comfort level that the world is confronting terrorism as resolutely as it should be. Thus, unfortunately, I believe that what happened to me 37 years ago, or worse, can happen again. 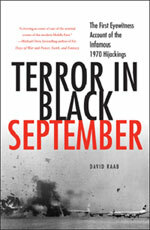 David Raab is author of Terror in Black September: The First Eyewitness Account of the Infamous 1970 Hijackings (Palgrave Macmillan). Your story is most horrific and yes, it is true that issues within the Middle East are escalating. I worry about what will be for my children and my grandchildren. Bare in mind, my children are still in single digit number ages. I see this as a very well planned out m o by the ever patient Arabs over many millenia. I see it getting worse as we come doen the home stretch toward Moshiach's arrival. I try to work "yiddle by yiddle" as the expression is-meaning to bolster other Jews' ties with their Judaism etc.... The rest of the world seems to be caught between two roads-anti-semitism and blindness about what the Arabs want from them - to use the rest of the free world as a stepping stone to get towards their over all goal: control over the entire world. With over three billin radical Muslims in the world today: it is not so far fetched. We should be scared-yet, scared enough and rational enough to counter their m o with our own and to be forthright and stop worrying about what is politically correct already. The Palestinians have caused trouble wherever they have gone. One can go back to the 1929 massacre in Hebron. Jordan, Lebanon, Gaza; it doesn't matter - the result is always the same. They have a long history of violence against Jews and each other. It's the tribal mentality, highly ethnocentric Islam and a dash of sexual repression. The worst thing that could happen to them is for them to get their own country. Then they would officially become the worst of all worlds: a terrorist, over-populated, welfare state. Will the world ever listen and learn? Who really wants to know a Jewish story? "war mongerers". Having the "president of Iran" speak at the U.N. it reminded me of the "intellectual" Germans calling Hitler a clown and never believing that it will be he who will become their leader, this leader looked to me like a clown too. What will be the world's disaster now? will there be a world left? with so many Moslems everywhere in the world a "black September" is imminent and Mr.Raab's story will become a minor occurance in the world's arena. Those who want to listen BE WARNED!! !IT'S HERE STOP IT WHILE YOU CAN!!!! Not only Israel's in danger but YOU ANYWHERE AND EVERYWHERE YOU ARE !!!!! UNFORTUNATELY, YOUR LAST COMMENT THAT IT MAY NOT BE THE LAST TIME, IS NOT A MAYBE, BUT A DEFINITE! SADLY THAT NO ONE TAKES IT SERIOUSLY, AND THINKS NEGOTIATION WITH EVIL IS THE ANSWER. NEVER WAS AND NEVER WILL BE! I was unfortunately involved with a woman that played an important role in this horrible terrorist action , She came from Nicaragua and was trained by Cuba and was also in Eastern Europe for training as a urban terrorist . She was in charge of logistics and finance , as she told me some time ago . She was then resident in europe. Agood read , I'm sure , but a sad subject for the world . This news is different than radio TV and I like what you have to say. I don't recall any of this happening. It wasn't like Entebbe which was made into movies.